I’ve been in Frankfurt, looking at the Energiewende, the German term for the transition from an energy wasteful fossil fuel economy to one based on the efficient use of renewables as the basis for the entire economy. There really are some impressive things going on here. Frankfurt has more Passiv Haus and other green accredited (LEED, DGNB, BREEAM equivalent) buildings than any other city in the World. Much of the current buzz in the city is about energy positive buildings, ones that actually generate more energy than they consume. The possibilities with new buildings are tremendous and the additional construction costs usually can be paid back very quickly in terms of reduced energy bills, or income from surplus energy. However, of course, retrofitting existing buildings is more problematic, but still it is staggering just what is being done here. 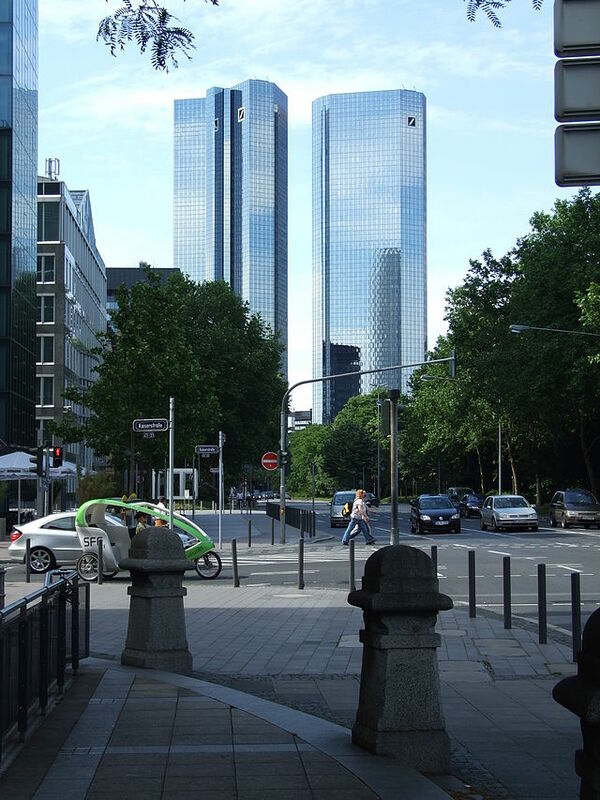 The twin towers of the Deutsche Bank were built in the 1980’s, 155 metres high, with 38 floors in one, 40 in the other. From 2007 to 2010 they underwent a very comprehensive eco-retrofit. The achievements are worth listing: during the reconstruction over 98% of the building material was recycled, the building now uses 67% less energy for heating and cooling, 55% less electricity, 74% less water, and 89% reduction in carbon emissions have been achieved. This was the first retro-fit to be awarded LEED Platinum accreditation. Many other buildings across the city are now being retrofitted, which collectively and over time will substantially improve the energy efficiency and sustainability of the whole built environment. But it’s not just the buildings that are impressive. Public transport here is excellent as are conditions for walking and cycling. Note the cycle taxi in the photo above. In the Deutsche Bank reconstruction the car parking provision was reduced and that for cycling expanded. The city of Frankfurt, and the whole Frankfurt-Rhein-Main region, are planning an energy future that is based on 100% renewable energy for electricity, heating, cooling and then also increasingly for transport. And they plan to generate most of it locally, which if can be done in Germany, it can be done in UK, which overall has better potential sources of renewable energy. A very efficient district heating network is being rolled out, fed by an evolving mix of energy sources such as the combined heat and power plants at Fechenheim, which uses local biomass, or that at Niederrad that is gas powered. Currently that gas is mainly ordinary fossil gas, but increasingly the gas used will become a renewable resource. Bio-methane from anaerobic digesters is already been fed into the gas main in growing quantities. Surplus wind power is now beginning to be converted into both hydrogen and methane to be fed into the gas grid, or used as transport fuels, or stored and then used to generate electricity for when the wind isn’t blowing or the sun shining. Wind to gas is becoming ever more significant as wind power grows. It, along with a whole raft of other technologies, means that the problems often associated with wind such as its intermittency and variability can be overcome. Hats off to ITM Power, Thuga Group, Fraunhofer Institute and Mainova who are developing and implementing this most useful of technologies. Innovation is at the heart of the Energiewende. I wish this portfolio of policies and technologies was better understood in the UK. Groups of town planners, architects, and perhaps most of all, politicians should come here and see what is going on. We in the UK have a lot to learn from places such as Frankfurt. This entry was posted in Buildings, Climate Change, Energy, Global on 15 October 2014 by Richard. Isn’t what most people want the world over pretty much the same? They want to feel safe and secure, they want peace and justice. A political system that is inclusive, participatory, egalitarian and democratic. An economic system that gives them opportunity to do meaningful, satisfying work and that promotes social cohesion and solidarity. Freedom and tolerance to express their religious, cultural, philosophical or artistic beliefs. Space for nature and wilderness, and the opportunity to experience it. Increasingly people want to know that the planet is not being wrecked by our collective actions, and they see the profound changes we must make in order for this to be the case. The last couple of weeks I’ve read the daily reports of the student protests in Hong Kong. I am overwhelmed by admiration for these young people. They are polite, peaceful and very well organised. 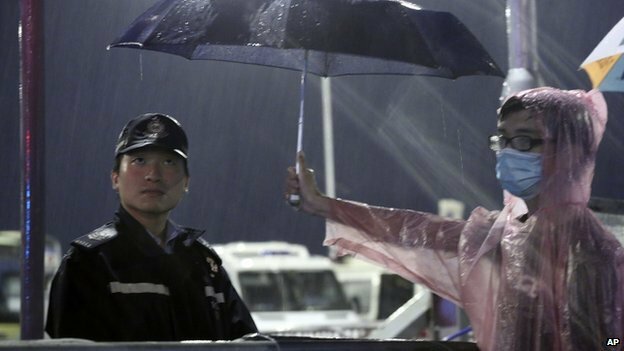 The above photograph of a protester holding an umbrella so as to protect a policeman seems to sum up these last weeks of protest. I witnessed this same spirit of peaceful protest many times in my life, perhaps most impressively at the Occupy protests that I blogged about in November 2011. I recall the many times these protests have been met with violent state repression. Chinese oppression in Tiananmen Square in 1989, the USA in 1970 at Kent State University, the Russian quashing of the Prague Spring of 1968 and of course countless others. The Arab Spring which everywhere initially involved similar peaceful protest, which was frequently met by brutal state repression, and has descended into chaotic civil war in Syria and Libya. That surely is what no one wants, and it is a situation from which only the most brutal and fanatical thugs ever prosper, and in the end they too are victims of this traumatic chaos. It looks like the Hong Kong protests are quietening down and turning into a series of talks, as nobody wants a repeat of Tiananmen. But one thing is certain, the quest for a more democratic and inclusive political system will not go away, in Hong Kong, or anywhere else in the World. This entry was posted in Politics on 8 October 2014 by Richard.